We all want to achieve our best, be it our best lift, best 100m or even just the way we look. With the development of supplements over the past 30 years people are making ridiculous gains in the gym, track or on the field through science. Therefore we would like to offer our opinion on what we think are some of the best supplements out there. We will keep it simple and the list is based on the core products that anyone new to lifting should have in their locker. 2 2. Best Testosterone Booster. 3 3. Best Fat Burner. 5 5. Best Weight/Mass Gainer. Mprotein.com Hurricane XS – this is our staple. A great list of active ingredients, a great protein count, loads of flavors and well priced. And Myprotein products are independently batch tested to ensure quality. Testofuel is a fantastic test booster with proven ingredients and best of all, proven results from users globally. We have seen some amazing PB’s since using Testofuel. Instant Knockout is present on every desk in the office as well as a host of UFC fighters. Admittedly our regime isn’t quite as intense but the results are. A brilliant product for anyone looking to shed those annoying excess pounds. The Protein Works offer simple and effective creatine monohydrate at a low price. TPW products are also independently batch tested to ensure quality and safety to help you attain that extra explosive edge in your preferred sport. However, we are very interested in the creatine tablets offered by Protein Active. Supplements are here to do just that – supplement our diets with extra nutrition that we may find hard to consume from eating at meal times. The truly best mass gainer for those looking to add significant bulk is through dense foods such at oats, eggs and nuts. Rich Piana recommends the following: oats, eggs, peanut butter and a banana blended together to conveniently consume the calories required for bulking. I love to have a potato with eggs, tuna and cheese finished off with hot sauce at lunch time. Sometimes eggs will just not do, I always find it difficult to do any form of exercise for at least 2 hours after a heavy meals loaded with protein and carbs. I have found that the Protibrick works a treat for me. Not only is it light, there’s a nice dose of protein plus it is fortified with vitamins that are great for stimulating testosterone production! Straight after a beasting session in the gym or immediately after a rugby game I need a hit of protein but my stomach won’t handle something big or too filling, so I have found these little gel sachets that provide a 20g hit of protein plus they are fortified with a host of other vitamins and minerals which are also great for testosterone production – these are great to smash back in the changing room. They also support a cancer charity, so everyone is winning! What’s the point of a protein bar? When nibbling on a chicken breast isn’t convenient or even grabbing a shake, these little pocket fillers starve off hunger whilst feeding your muscles. The problem is, they have become massively inflated in price and size whilst not always offering the goodness you need. Now halt! These little beauties are truly pocket sized, taste great and pack a whopping 30g of protein plus B12, B6 and Folic Acid which are proven to stimulate testosterone production! 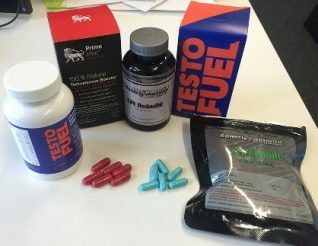 Mind Lab Pro is new to us here at Testosterone Junkie but Nootropics are now becoming extremely popular for anyone looking to get a mental edge; students are using them for revision and even professionals alike to improve cognitive function. We experienced better sleep and overall improved mental clarity.